Richard & Leona Kane of Broighter Gold came to produce Rapeseed oil for cooking by way of a serendipitous accident! Leona was cooking a couple of steaks for dinner one evening and ran out of olive oil, so Richard brought some of the unfiltered cold pressed rapeseed oil up to the kitchen and the rest they say is history! Broighter Gold have been producing rapeseed oil for chefs and homecooks around the country since 2006 and now have a diverse range of award winning infused oils to choose from as well as their award winning original rapeseed oil. Their lemon infused oil packs so much lemon flavour into dishes with no bitterness/sourness and it’s been really versatile in our SculleryMade meals. It’s delicious in salad dressings, over roast chicken, drizzled over pan-fried fish fillets, and we’ve even made a delicious lemon pesto with it too. The recipe below makes a creamy, zesty lemon mayonnaise, but the same recipe could be used with Broighter Gold’s basil-infused oil, or chilli-infused oil! We served this mayo with our Guanciale & Young Buck croquettas at a recent To Øl beer tasting evening in Belfast & the flavours went down a treat with our local beer lovers! Blitz the yolks & mustard in an upright food blender for 2-3 seconds. Gradually add the oil to the blender in a slow and steady stream, constantly mixing until a thick mayonnaise is formed. Add the lemon juice, zest, thyme and seasoning to the blender and mix for 5-10 seconds. Store the mayonnaise refrigerated and use within 24 hrs. Share your mayonnaise recipes with us on Twitter, Instagram & Facebook. SculleryMade is a Belfast blog sharing recipes using quality, locally sourced ingredients. Our main recipes include methods for cooking, baking, brewing and curing. Croquettas – irresistible, tasty little meat & cheese-filled morsels! Crunch through the outer crispy golden shell to find an oozing, soft centre full of flavour… This recipe comes with a disclaimer – you will not be able to stop at just one croquetta. Or two, or three!! These Spanish-inspired bites bring together Young Buck – a creamy raw blue cheese made by Mike Thompson of Mike’s Fancy Cheese with Moyallon Guanciale, locally-cured pig cheek from The Meat Merchant. If you’ve not had Mike’s Young Buck and Peter Hannan’s Guanciale together on the end of your fork yet, you’re in for a real treat! Young Buck is a creamy stilton-like raw blue which melts around the crispy sweet and salty Guanciale in these croquettas. They’re delicious dunked into homemade lemon & thyme mayonnaise made with Broighter Gold’s lemon-infused rapeseed oil for a tasty beer snack or served up as a starter or on a party platter. Here’s our mayonnaise recipe if you’d like to give it a try too! After you’ve tried these, be as creative as you like with the fillings in Croquettas – I’ve also made some with spiced beef & blue cheese, coppa and mushroom, black pudding & Guanciale … and the same goes for the mayonnaise, there are so many infused local oils to choose from! 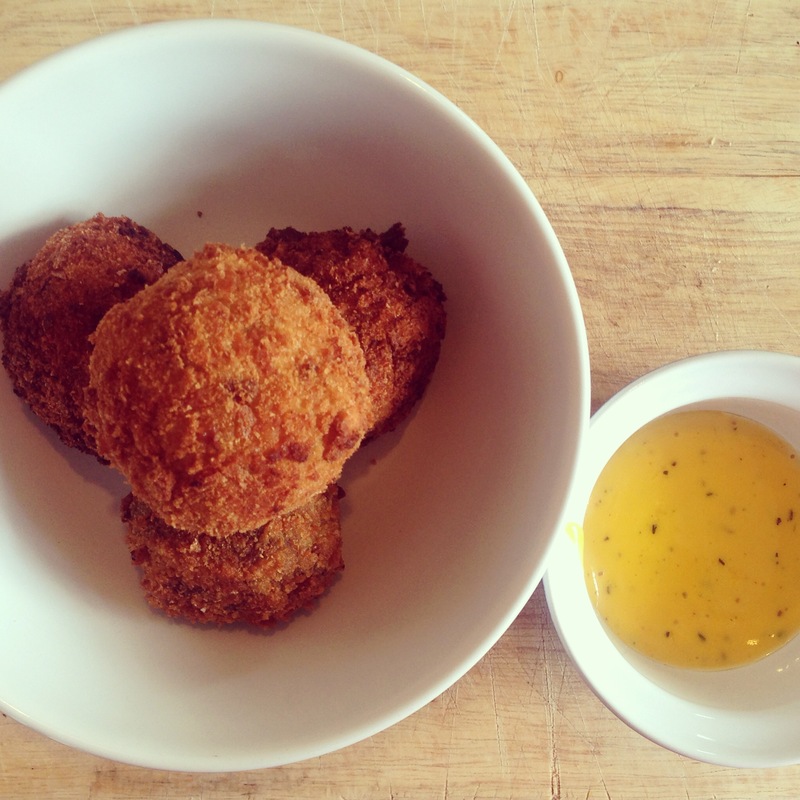 Mike’s cheese in Arcadia Deli & a croquetta made with Guanciale & SculleryMade black pudding. Fry the Guanciale and cut into small pieces, retain any leftover oil from the pan. Melt the butter in a pan and season with pepper. Add any juices from the Guanciale pan to the melted butter. Slowly add a quarter of the flour and mix into the butter over a low heat. Gradually add the milk and remaining flour constantly mixing until you have a thick paste. To the paste, add the fresh breadcrumbs, chopped Thyme, Guanciale and cheese and mix evenly through the paste. To make the breadcrumbs, lightly toast the bread slices. Using a food processor and standard blade, blitz the toasted bread for 2-3 minutes until it’s reduced to breadcrumbs. To prep the croquettas, heat a deep-fryer filled with broighter gold plain rapeseed oil on high. Set up three bowls – One with plain flour, one with the beaten egg and a third with breadcrumbs. Shape the paste into golf ball sized pieces and cover in flour, roll in the egg wash, roll in the breadcrumbs and fry until golden brown in the deep-fryer. Fry in small batches of 2-3 to avoid the temperature of the oil dropping too low.